What Are the 7 Most-Often-Missed Items During a Website Launch? Is it time to update your website? Are you adding more services to your portfolio, or trying to turn it into a “lead-generating machine”? Nowadays, there is so much to track in terms of a new website implementation that it can be very stressful. In addition to defining your overall strategy, writing your content, choosing your images, and approving the design, you need to ensure that the right people are finding…and visiting…your new site. 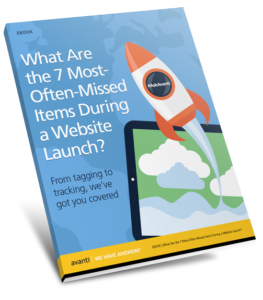 Take a deep breath, download our eBook that lists the 7 Most-Often-Missed Items During a Website Launch, and let that tension go.